Single and three-phase models are available from 0.4kW to 2.2kW in the 200V class and in three-phase from 0.75kW to 132.0kW in the 400V class. Speed setting is either via an external analogue or digital signals. A built-in keypad with LED display is used for programming and is included as standard. The IP54 Series has advanced protection sensing circuits and there are alarms for overcurrent, over voltage, under voltage, over temperature, overload, ground fault and so forth. 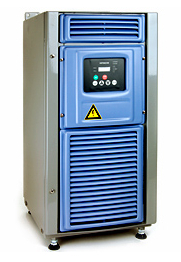 Automatic voltage regulation is included for output voltage control.